The simplest of Mikel Arteta free-kicks and a late Steven Pienaar strike handed Everton a seventh successive home league win as 10-man Bolton crumbled. Bolton's Kevin Davies came closest in an uneventful first half but Tim Howard bravely saved after a flowing move. The game turned with the 70th-minute dismissal of Gretar Rafn Steinsson, who bundled over Yakubu as the last man. 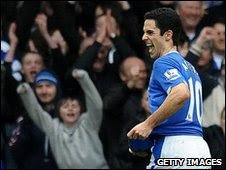 Arteta looped the resulting free-kick home and Leon Osman hit the post before Pienaar's powerful, decisive second. With both teams in good form, neither manager saw fit to make changes to their starting line-up, but Everton boss David Moyes soon found his hand forced. "We had the best of the play and we controlled most of the ball in the first half without being able to create in the final third. "We needed a good Tim Howard save in the first half but we needed to be patient and we got our reward in the end. "It was a great pass by Steven Pienaar to get Yakubu away - scoring the goal as well was a double whammy for Bolton, and it was a great free-kick. "In the last few games, Mikel Arteta has been getting back to his best. He's nursing a couple of minor strains but he's so keen to keep going." "Yakubu took a great touch across Gretar Rafn Steinsson and invited Steinsson to come onto him. If there's a collision there's not a lot of contact, but Mr Wiley deemed it a red card. "To rub salt into the wound, because I believe it was a contentious decision, Mikel Arteta was allowed to take the free-kick four yards closer than he should have been. "I don't agree with the decision and with then allowing Arteta to bring the ball forward to the arc, with the quality he's got. "We carried on the fight, accepting that Everton had chances, but I'm disappointed to leave with nothing. I felt we offered an awful lot to the game." 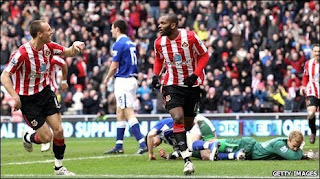 Sunderland claimed their second win in three games with a hard-fought victory over a spirited Birmingham. The Black Cats were ahead as early as the fifth minute courtesy of a neat finish from Darren Bent from six yards. The England striker made it 2-0 just six minutes later, finishing well after being fed in by Steed Malbranque. Birmingham rallied well and on the hour Cameron Jerome ran clear to pull a goal back, but late on Fraizer Campbell's sliding finish sealed the home victory. Having finally claimed their first win of 2010 with a 4-0 thrashing of Bolton on 9 March, Sunderland have, by the admission of manager Steve Bruce, begun to play with a greater freedom and style than at any other time during his tenure. One of the chief individual beneficiaries of this has been striker Bent, who has recaptured his goalscoring touch in spectacular fashion to reinvigorate Sunderland's season and boost his chances of making Fabio Capello's squad for the World Cup this summer.